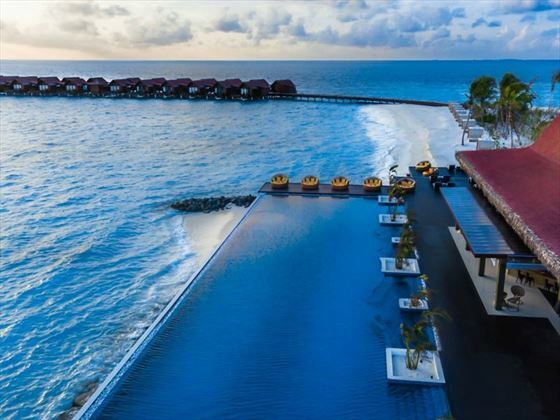 Experience paradise on earth at Grand Park Kodhipparu, designed by an award-winning hospitality firm, this one-island-one-resort destination welcomes you to an oasis of pure tranquillity and undeniable luxury. The resort’s classic island architecture and contemporary design showcase an inviting, peaceful and sophisticated atmosphere, with high palm-fringed ceilings and hand-crafted furnishings created by local craftsmen, whilst classic neutral tones blend with bright splashes of tropical colour. 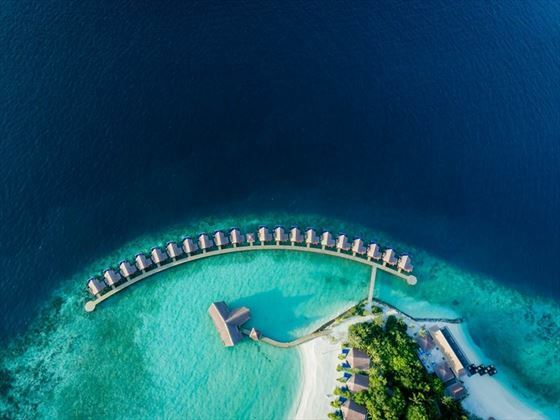 There are six villa categories in total, ranging from serene retreats perched above the crystalline lagoon waters, to breath-taking beachfront hideaways nestled into luscious tropical foliage. 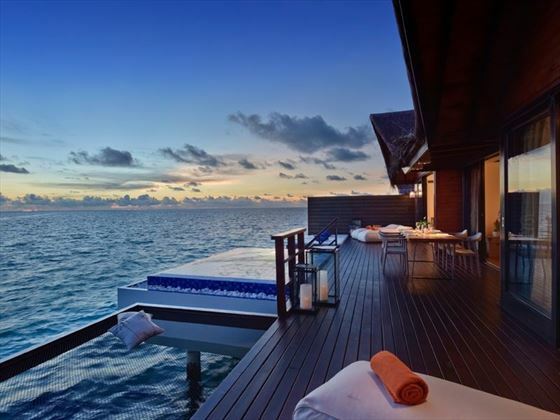 Each villa is equipped with a plush king-size bed, spacious private terrace with direct lagoon, sea or beach access, a 43-inch LED TV, luxurious spa-style indoor/outdoor bathrooms and an ample supply of living space, whilst some also feature a private infinity-edge pool with stunning ocean views. The resort features three spectacular dining venues, serving a wide selection of delectable culinary creations from all around the world, alongside breath-taking ocean views. The Spa offers a unique wellness experience with a selection of signature skin and body care treatments, whilst the Yoga and Meditation pavilion, fully-equipped modern fitness centre, beautiful infinity-edge pool and a fantastic Beach Club are wonderful spots to relax and unwind. The resort is also very family-friendly, featuring a wide array of children’s activities, including a kids club, babysitting services and a children’s pool. The PADI-certified specialists at the Diving & Watersports Centre also offers the opportunity for you to enjoy a fantastic variety of water-based activities, and to explore the best reef in the island. 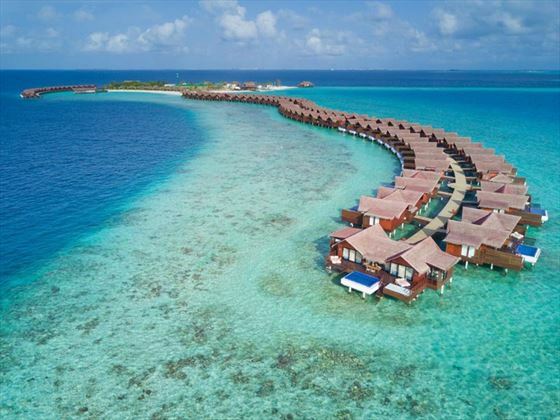 Located on the island of Kodhipparu, famous for its dive sites and abundant marine life, the resort offers a wonderful setting in the blissful, dreamy Maldivian landscapes. 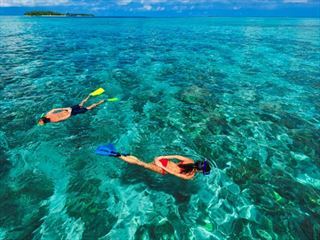 Offering more than just a romantic island destination for couples and honeymooners, the resort’s setting in the North Male Atoll features many spectacular experiences underwater too, with world-renowned snorkelling and diving sites nearby, including wreck sites. Perched above the sparkling lagoon waters, with a fantastic location near the islands facilities, these bright and tropical villas span over 80 square metres of beautifully-appointed living space. 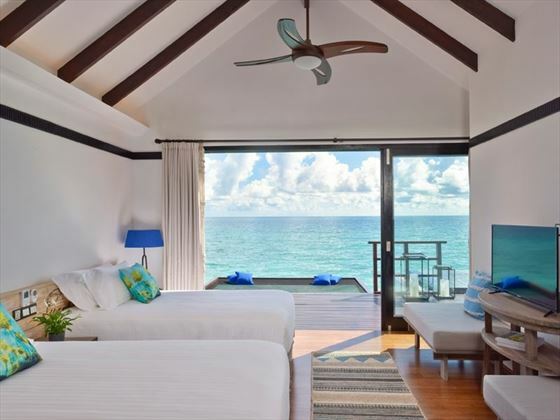 These comfortable and spacious abodes boast magnificent views of the azure ocean horizon, in addition to direct access to the tropical reef and ocean. Accommodates up to three people. 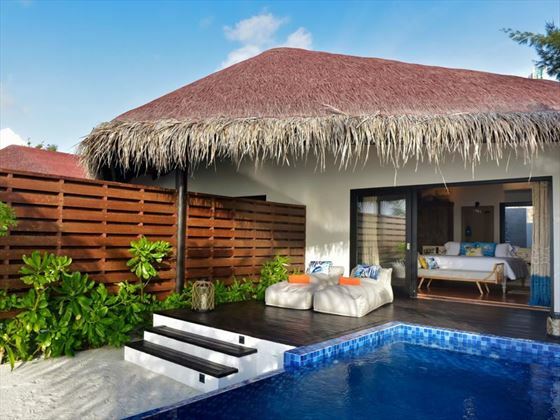 Set atop the calm, crystalline lagoon with sublime exotic vistas facing north of the island, these sumptuous villas span over 80 square metres of serene living space with a similar layout and selection of amenities to the previous accommodation category. Accommodates up to three people. 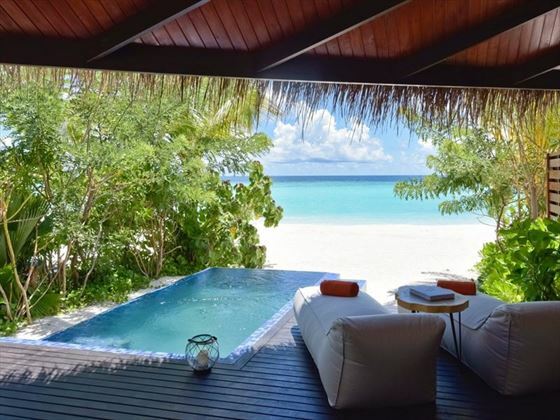 Adorned by luscious tropical foliage, these secluded and luxurious villas are equipped with a large private plunge pool facing the ocean horizon, in addition to direct access to the powdery white sands of the beach. Featuring 78 square metres of living space, these gorgeous abodes are decorated with modern tropical furnishings, and accommodate up to three people. 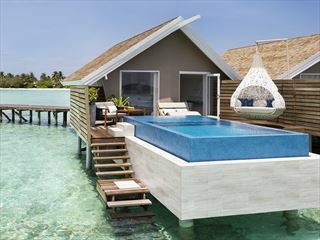 Sumptuous and breathtakingly beautiful, these 93 square metre hideaways are enveloped by the cerulean waters of the reef, and an endless horizon of sparkling sea waters. 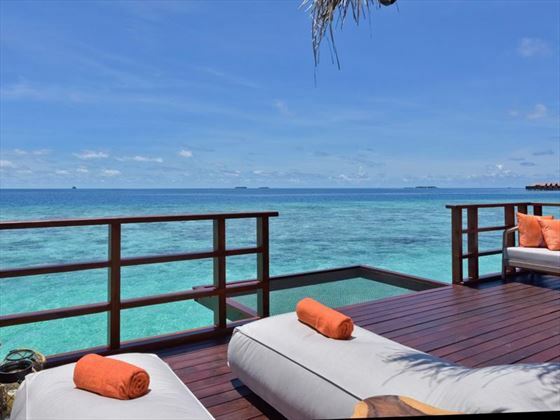 Perched over the exotic reef, these villas offer an incredibly romantic, serene and intimate ambience, whilst a pampering selection of amenities ensure a lavish stay. Accommodates up to three people. Providing an oasis of calm and serenity, these enchanting and incredibly spacious villas blend contemporary bright interiors with beautiful woven textures that reflect the island’s rich culture. Spanning over 93 square metres of private and peaceful living space, you’ll also delight in stunning lagoon vistas from your private pool and terrace, with direct access to the warm, tropical waters below. Accommodates up to three people. Luxuriate in the most opulent, spacious accommodation the resort has to offer, spanning over an incredible 210 square metres of private, gorgeously-appointed modern living space with two bedrooms, an exclusive living space and two bathrooms. While away time as you watch hundreds of tropical fish swimming idly from the villa’s glass floor, soak up the breath-taking panoramic scenery of the Indian Ocean from your infinity-edge pool, or simply stargaze as you dine in this private sanctuary after sunset. Accommodates up to five people. 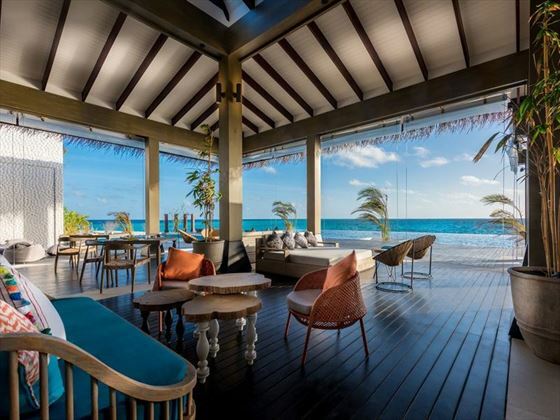 Situated by the ocean’s edge, this beautiful and exotic eatery welcomes you into its contemporary and open spaces, designed to showcase uninterrupted views of its picturesque surroundings. 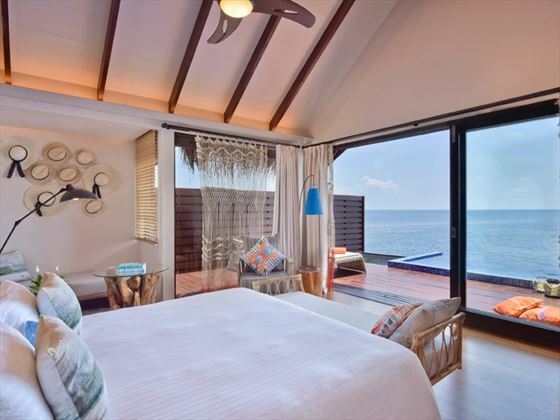 Maldivian influences are reflected in the pinewood timbre flooring, roof and ceiling features, and extend to the beautiful furnishings and décor created by local craftsmen. You may choose to dine in the cosy indoor lounge, or on an overwater private pod, ideal for romantic evenings or private group dinners. Delight in a wide selection of international culinary creations from the restaurants extensive buffet, which also features live cooking stations where seasonal specialities are prepared on demand. Breakfast served from 7am to 10:30am, Lunch served from 12:30pm to 3:30pm, Dinner served from 7pm to 10:30pm. Boasting a spectacular backdrop of tranquil, panoramic ocean vistas, this laid-back pool bar serves modern, light menus with contemporary adaptations of Asian and Mediterranean classics, in addition to international favourites such as burgers, pasta and salads – the perfect spot to refuel after a refreshing dip in the adjacent infinity-edge pool. At sunset, Breeze transforms into a relaxed bar where talented bartenders create tantalising cocktails, served alongside light snacks, fine wines and chilled-out music with unforgettable vistas of the transforming sky. 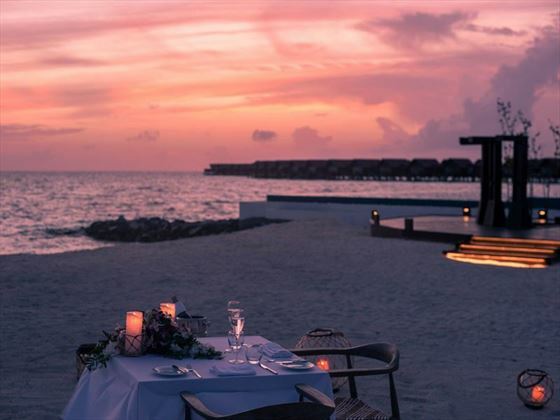 Nestled in an intimate setting away from the resorts other facilities, this exclusive restaurant sets the stage for a special occasion or celebration. As you enter, you’ll be greeted by a hive of activity from the show kitchen, featuring an impressive Josper grill. 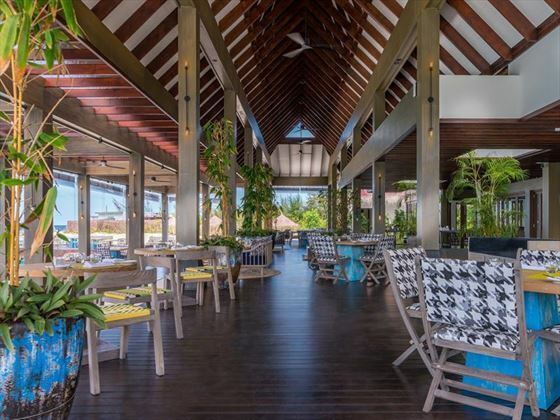 At the heart of the restaurant, schools of colourful fish swim in the beautiful lagoon, adding to the relaxed ambience as you dine on modern European cuisine and sip on fine wines in the privacy indoors or alfresco on the beautiful patio set by the serene ocean waves. Award-winning Spa offering blissful holistic treatments and signature spa sessions using a distinctive range of organic, paraben-free skincare products tailored to each individual guest. 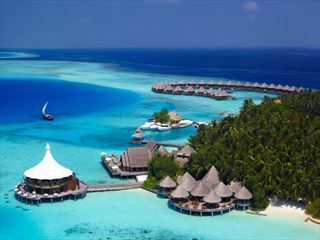 Features 7 over-water treatment rooms, a beauty salon and a relaxation room.